The annual New Jersey Marathon and Long Branch Half Marathon will take place in Long Branch, NJ this weekend. For full details on the events surrounding Marathon weekend, visit the New Jersey Marathon website. 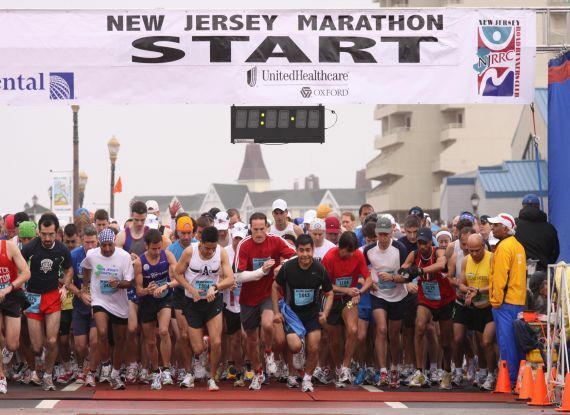 The New Jersey Marathon Festival has something for everyone, with a Marathon, Half Marathon, Half Marathon Relay, and Saturday Kids and Family Events, plus world-class courses designed for speed, great area restaurants and attractions, and amazing oceanfront scenery. Friday and Saturday will feature and Health and Fitness Expo at Monmouth Park. The running related expo will be free, and open to the public, as well as to all participants in The New Jersey Marathon Festival. Last-minute race applications will be accepted during the expo (no registration on race day). The prices are as follows: Full Marathon: $135.00 and Half Marathon: $115.00. The Expo Hours: 1:00pm to 8:00pm on Friday (4/29), and 9:00am to 6:00pm on Saturday (4/30). There will be a special New Jersey Marathon Train from NYC Penn Station to Long Branch to ease your travel worries and traffic. Click here for the race day schedule. Not into running for hours? No worries, there’s plenty more to do like see a show or dine in some really great restaurants. Saturday April 30th 11:00am to 5:00pm is Taste of Asbury Park. Over 16 Asbury Park Restaurants will be participating. It will be an event to appeal to everyone with children’s face painting, stilt walker, games, craft vendors and local artists. Rock on with three bands playing jazz, classic rock and reggae. Discover what Asbury Park restaurant have to offer with food for $3 or $5 from every participating restaurant. Beer, wine and other beverages will be available as well. This year a VIP wine tasting tent has been added. Entrance to the event is only $5. Click here for complete information on Taste of Asbury Park. His observational humor about everyday events like shipping a package, visiting the optometrist, little league baseball, spelling bees and science projects are relatively “clean” and profanity-free, and resonate with a fan base ranging from young taste makers to middle-aged adults. Middletown Arts Center will host “An Evening With Billy Van Zandt” at 7:30pm on Saturday, April 30th to benefit Middletown Township Cultural & Arts Council. Enjoy an exciting evening with actor/writer/producer Billy Van Zandt as he provides an inside look at his life and career. The evening will be moderated by actor Jeff Babey. Ticket price is $100. Purchase tickets early for preferred seating. Event is followed by a wine and cheese reception in the MAC gallery. Tickets are available online here. Saturday is the start of the week-long “Paint The Town Pink” in Red Bank to raise awareness for breast cancer. Red Bank turns into Pink Bank for this annual event sponsored by Riverview Medical Center. Pink (Monmouth) Beach and Pink (Fair) Haven will also host events in their respective towns. There are a number of events occurring throughout the 3 towns from April 30 to May 7, 2011. Visit pinkbank.org for a full listing of events, details and to donate. **Update 4/29*** I forgot about Red Bank’s the first Only One Red Bank Home Event. Like a Home Improvement Show, this event spotlights design, appliance, furniture and other businesses in Red Bank’s wonderful business district to help you plan your Spring cleaning and home improvement projects. Consult with design professionals and specialty merchants to bring your home improvement dreams to life! And… Visit 10 businesses to be entered to win a $500 Red Bank Gift Card, great prize packages and more!. So, enjoy your Saturday shopping and planning while indulging in special treatment of entertainment and refreshments at our great participating businesses, and fulfill your home improvement dreams! Then, stop for dinner at one of Red Bank’s great restaurants! We hope to see you in our neck of the woods shore this weekend. There’s a lot of fun things to do and see. If you can’t make it this weekend, watch for next weeks post on: More Pink Bank, the start of Atlantic Highlands Farmers Market (a sure sign of warmer weather), First Saturday in Asbury Park, New Jersey Vietnam Veterans Remembrance Day Ceremony and Taste of Sea Bright. Whatever you do, have a fabulous and relaxing weekend. This entry was posted in Area Events, Cool Stuff To Do, Count Basie Theatre, in Asbury Park, Jersey Shore Travel Ideas, Uncategorized, Weekly Events and tagged Billy Van Zandt, Brian Regan, Count Basie Theatre, Jersey Shore, NJ Marathon, Pink Bank, Taste of Asbury Park by Barb Youchah. Bookmark the permalink.